The new Richard Gere/Oren Moverman film has an intense subjectivity that marks it as more of a thorny character study than a therapeutic feel-gooder. Richard Gere stars in Time Out of Mind. Directed by Oren Moverman. With Richard Gere and Jena Malone. Opens Friday. Writer-filmmaker Oren Moverman is responsible for some of the liveliest, most inventive screenplays of the past ten years. A dedicated maverick collector, he has cast his eye on enigmatic cultural icon Bob Dylan (with director Todd Haynes, in I'm Not There); stressed-out military men (The Messenger); rogue police officers (Rampart, co-written with James Ellroy); and, in one of this year's best films, the hurt-filled backstory of the Beach Boys' Brian Wilson, Love & Mercy. So when we learn that Moverman's latest movie deals with homelessness, we expect a novel approach to a subject with which most urban Americans are all too familiar. Time Out of Mind does not disappoint. In its portrait of a downward-bound alcoholic named George Hammond (Richard Gere), Moverman's screenplay shies away from the problem-solving agenda of most social dramas, in favor of something more difficult, less easily itemized. Its intense subjectivity marks it as more of a thorny character study than a therapeutic feel-gooder. The very first thing we notice about George's world is how chaotically noisy it is. Voices and music drift into the mix from other rooms, from down the street, from TV and radio shows, as if overheard. Director Moverman's team of sound technicians creates an insistent chorus behind everything George does. Eventually we come to understand that the sub-soundtrack mostly comes from inside his head, but it's never gratuitous. It's the sound of New York City, the ocean in which he swims. The visuals achieve the same scattershot effect — we glimpse events through doorways and dirty windows, surreptitiously, as if spying. George drinks, wanders Manhattan's Lower East Side, peeps through the window of a saloon where his estranged daughter Maggie (Jena Malone) tends bar, encounters a woozy procession of fellow down-and-outers (notably played by Ben Vereen, Kyra Sedgwick, Jeremy Strong, and Steve Buscemi), muses sadly on his departed wife, flops in one shelter or another, then gets up, hocks whatever coat he has cadged the day before in order to buy a six-pack of cheap malt liquor, and starts all over again. At times his peregrinations resemble a documentary, but Gere's essential personality always shines through and we get to know George as much as anyone can. Even battered, unshaven, and decked out in dirty clothes, Gere is a seriously handsome man. The other bums notice this. He still has the same facial structure as the guys in Days of Heaven, American Gigolo, and Pretty Woman. The same peacock mannerisms, too, buried as they are beneath George's self-abuse and guilt. But that doesn't prevent us from letting George teach us a little of what it's like to be unmoored. Restrained as he is by Moverman's oblique scenario and distancing devices, Gere nevertheless gets under George's skin and demonstrates how quickly and irreversibly a person can slip up. It's a certified bit of Oscar bait, but so what? George's climactic scene with his fed-up daughter tingles the hair on our arms, as it should — never mind what comes after. Time Out of Mind shares a similar plot line with Paul Weitz's Being Flynn — drunken homeless dad, perturbed offspring, big-city shelter life — but Moverman purposely pulls back from filling us up with too many details. We have to grasp George and Maggie (and Vereen's gabby sidekick Dixon, as well) from what we see and hear in front of us. The story travels, figuratively, about two blocks. It withholds unnecessary information but drills down into its main character until we begin to see through his eyes. 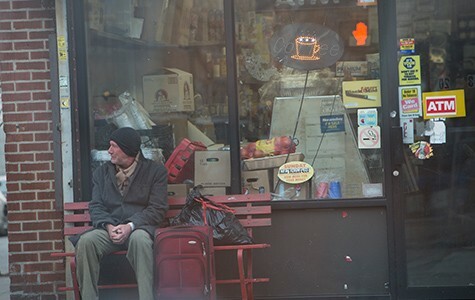 In that respect, Moverman's stripped-down portrait of a loser resembles Lionel Rogosin's compassionate-realist masterpiece, On the Bowery, set in or near many of the same streets George would tread sixty years later. The time is always right to take a walk in someone else's shoes.